For this month's "Maps Of The Month" featurette, I wish to draw your attention to gocha's Ganbare Goemon 3: Shishijyuurokubei no Karakuri Manji Katame (J) (Super NES) maps. In the third main Goemon game for the Super Famicom, The Wise Old Man creates a time machine to chase after women in other time periods. But in the future Neo-Edo, Ebisumaru's descendent, Sister Bisumaru, captures the Wise Old Man and has him build a robot army to take over the present-day Edo. Once again it's up to the mystical ninja Goemon, Ebisumaru, Sasuke and Yae to save the day, in their usual wacky fashion! Each of the four main characters has unique skills, to help them traverse this action-adventure game that has a lot of variety. There are overhead areas, there are side-scrolling areas, there are times when you run away in little mechs (with Mode 7 scaling!) and there are times that you pilot the giant mech, Impact. Thanks to the mapper gocha, VGMaps has got you covered. Some areas are huge, and many of the side-scrolling platforming sections have two "layers", "front" and "back". It's quite a sizeable game! Now, two Japanese-only games recognized for "Maps Of The Month" in a row? And the longest title by far (longer than even May 2006's King's Quest V: Absence Makes The Heart Go Yonder)! Though the Goemon franchise includes quite a number of video games in Japan, only four of them have been released in North America: one each for the Super NES and Game Boy, and two on the Nintendo 64. That being said, it's nice for gocha to have given one of several Japanese exclusives some attention, and shared its maps with us! 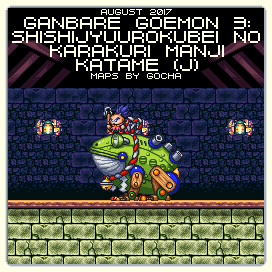 So for bringing us another look at the underappreciated Goemon, gocha's Ganbare Goemon 3: Shishijyuurokubei no Karakuri Manji Katame (J) (Super NES) maps will be known as VGMaps.com's Maps Of The Month for August 2017. It's seems like that game was a pain to map or maybe not but you did a fine job my friend! I wish there was and Eng translation for some of those. Have yourself a break, you deserve it! I remember playing the Mystical Ninja on Snes back in it's release era and it was very fun. It's really too bad that we only got the first one here in the states. The next one to ever get released in the states was the N64 versions (two games officially I think...) It will be nice if and when we get some more mystical Goemon game levels mapped. After I'm done with Castle of illusion I'll see about getting some more for Mystical Ninja.